I love vegan restaurants, but sometimes they can be a bit "too healthy" for my guy's tastes. He loves quality beers and cafe items like sandwiches, and, while vegetarian, appreciates real cheese. So when I made our itinerary for D.C., I was looking forward to stopping by Bread & Brew, a cafe with coffee, beer, and some vegan options on the menu. Bread & Brew looks like a deli on the top floor, with a moderate amount of indoor seating and a nice patio area as well. There is also a cozy bar downstairs, which you can visit to order beer with your meal. I was glad to see that the non-vegan options seemed to be thoughtfully-sourced from local suppliers with humane and organic options. 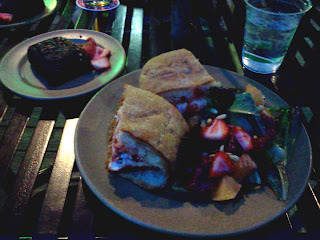 There was even a vegan chicken parmesan on the menu, which tasted amazing. Vegan options were clearly marked and there was even a vegan brownie for dessert. The food was fresh and high-quality, but vegans should recognize that this is a vegan-friendly restaurant, so the options will be more limited (and may rotate throughout the week). I really liked the atmosphere, and it was great to have a place where I could go and eat vegan while my guy could eat dairy and eggs that were from better sources. We also appreciated the large sign out front, making this an easy place to visit for tourists like us. If you're in D.C. and looking for a cafe with fresh food that caters to a variety of appetites, Bread & Brew is a nice option. Disclosure notice: This restaurant was reviewed during a paying visit by the reviewer. No compensation was accepted and the opinions are my own. Please verify any claims with the manufacturer, especially if you have any allergies or concerns. Labels: Food, Travel, Washington D.C.